It’s time for the ASPCA-Rachael Ray $100K Challenge! Click on the logo for more info! The ASPCA is gearing up for the start of the 2013 ASPCA Rachael Ray $100K Challenge, where a total of $600,000 in prize grants are up for grabs to help shelters save more homeless cats and dogs. The ASPCA Rachael Ray $100K Challenge is a groundbreaking contest that challenges animal shelters across the country to come up with innovative ways to engage their communities and get more homeless cats and dogs into loving homes. The 49 contestants will work to save more animals – during the months of June, July and August 2013 – than they did over the same three-month period in 2012. Last year’s competing shelters saved more than 56,000 cats and dogs during the contest, an increase of 14,376 over the same period in 2011. For a full list of participating shelters, visit challenge.aspcapro.org. Since Dakota and I live in Michigan, we are going to be pulling for the Friends for the Dearborn Animal Shelter and will help promote them when we can to help them increase their adoption numbers! The ASPCA and Rachael Ray will award a $100,000 grand prize to the shelter contestant that achieves the greatest increase in lives saved during this three-month period. The contestant that does the best job of engaging its community members in helping to save more animals will win $25,000. Those organizations that do the best in their divisions will be eligible for between $10,000 and $25,000 in additional grants. In total, $600,000 in grant funding will be awarded for increases in animal lives saved, as well as a photo contest and general participation. All her life, Rachael Ray has been an advocate for animals and a supporter of animal welfare groups. Her love for animals and for her pit bull, Isaboo, inspired her to create her pet food (which you read about A LOT on Dakota’s blog) called Nutrish® to raise money for animals in need. Ray donates 100 percent of her proceeds from the sale of Nutrish® to organizations like the ASPCA so they can implement programs like the $100K Challenge and support shelters and animal organizations around the country. So what are you waiting for? Find a participating shelter in your area that you can support by visiting: challenge.aspcapro.org. Follow all the #100KChallenge action this weekend on Twitter, and best of luck to all the shelters as they embark on this exciting Challenge to save more lives! Dakota and I wish them all the best of luck! In full disclosure: Dakota and I were not compensated for this post. We were contacted by the ASPCA and were asked if we would share this info and we are more than happy to do so! The Take Steps Walk in Denver is an excellent opportunity to continue reaching out to those in need throughout the state of Colorado and especially those living with Crohn’s disease and ulcerative colitis. We will continue to expand the walk to include beautiful scenery, family-friendly festival, food, live music, kids activities, team village, pet place and exhibitors. 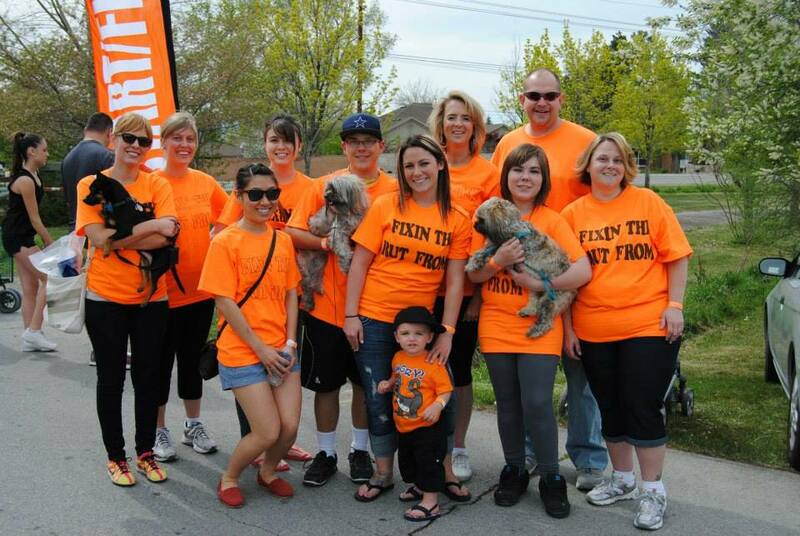 The Denver Walk is an established fundraising event with over twenty years in existence. We will continue to build on a new tradition at the Take Steps Walk at City Park on the Saturday before Father’s Day in June and are excited to have local businesses build this tradition with us. Last year, nearly 2,000 walkers participated and raised over $217,000 in the annual Take Steps Walk at City Park. Over 150 walks will be held throughout the country next year in every state and we want Denver to be number one. Our goal is to raise $250,000 here in Denver and you can help. 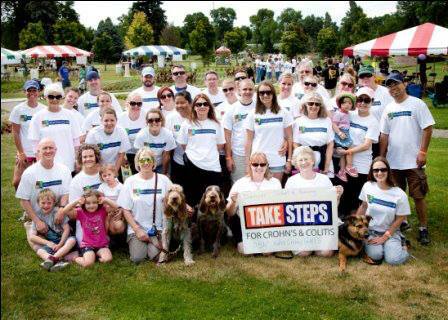 Many families, businesses and organizations already participate in Take Steps and the number is growing every year! In order to continue this growth, we must increase the number that take part in the Take Steps for Crohn’s & Colitis Walk. In doing so, we will reach our goal. 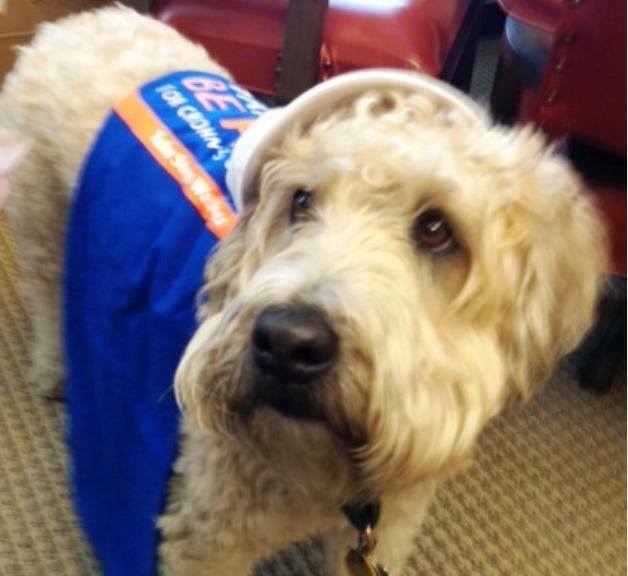 Dakota’s cousin, Baxter Stern, enjoys helping at the walk! along with other exhibitors from Camp Bow Wow, Canine/Feline Behavior Counseling, Green Buddies, Pawsitively Pooches, LLC Petsitters International, Stella and Chewy’s and more. Options to get involved are still available! If you live in Colorado or know anyone who does, please come to the Take Steps Walk on June 15. For more information visit www.cctakesteps.org/Denver or contact Jeremy Stern at jstern@ccfa.org. JEREMY STERN is the Sr. Walk Manager for the Rocky Mountain Chapter of the Crohn’s and Colitis Foundation. He is responsible for seven Take Steps Walks located in Colorado, Utah and Wyoming with the largest event being Denver, CO. His responsibilities include: managing the fundraising, corporate partnerships, event management and volunteer development for the Walk program. Before joining CCFA in February 2011, Jeremy worked for Hands On Miami responsible for corporate volunteer projects. Prior to this he also worked for the Marlins Foundation helping raise funds and manage programs for the Major League Baseball team’s Foundation. He currently resides in Denver, CO with his wife Emily and four-year old Soft Coated Wheaten Terrier named Baxter. The pup was named after Ron Burgandy’s companion in Anchorman and lives with his own case of digestive issues which has been diagnosed as colitis. Dakota and I have a personal relationship with Jeremy because he happens to be my nephew (and Dakota’s cousin!) We are proud of the wonderful work that he is doing and wanted to help spread the word to help raise funds for such an important cause. We are honored to have had Jeremy guest post today! Please share this post to help them reach their goal! Your city could win a $100,000 dog park! Entries Close May 31st! Bark for Your Park Contest! improve his or her community! Nominate YOUR city to win a $100,000 dog park!! To nominate a city, and for more information, simply visit www.petsafe.net by May 31. Finalists will be selected based on the availability of land, civic leader support, population size and total number of votes from community supporters. PetSafe will select 15 finalists based on information provided by the cities, and each community must provide documentation of land availability and civic leader support to be eligible. Once you’ve nominated your city, supporters can vote daily on www.petsafe.net and PetSafe’s Facebook page. Watch this video which explains how the “Bark for Your Park” contest works! PetSafe® Bark For Your Park Contest 2013 from Radio Systems Corporation on Vimeo. On June 5, PetSafe will announce the finalist communities that will continue “barking” for their park by voting daily on www.petsafe.net and PetSafe’s Facebook page. The finalist city with the most votes will be named the “top dog” and win a $100,000 PetSafe dog park, and four additional pet-passionate finalist cities will receive $25,000 to put toward their local dog park plans. “Bark for Your Park” contest winners will be announced on July 31. In full disclosure: Dakota and I were not compensated for this post. We met representatives from PetSafe at BlogPaws 2013 who emailed this information to us and asked if we would share it. Because we think this is a GREAT contest, we agreed to do so!! Hurry and enter and we wish you the BEST of luck! It’s National Pet Month in the U.S.! National Pet Month is a celebration of the benefits that pets bring to our lives and vice versa! In the UK it is celebrated in April, in the U.S. it is celebrated in May. You can do this by visiting websites such as Petfinder, where you can find over 300,000 adoptable pets from over 13,000 adoption groups! Make people aware of the benefits of pets for people and people for pets! Raise awareness of the role, value and contribution to society of working companion animals. and I am sure that you feel the same! DAKOTA’S DAD UPDATE: Thank you to those who emailed and/or left comments offering support and good wishes. Dakota’s Dad is doing well! Thank you so much for the power of positive thinking! Dakota and I love you all! 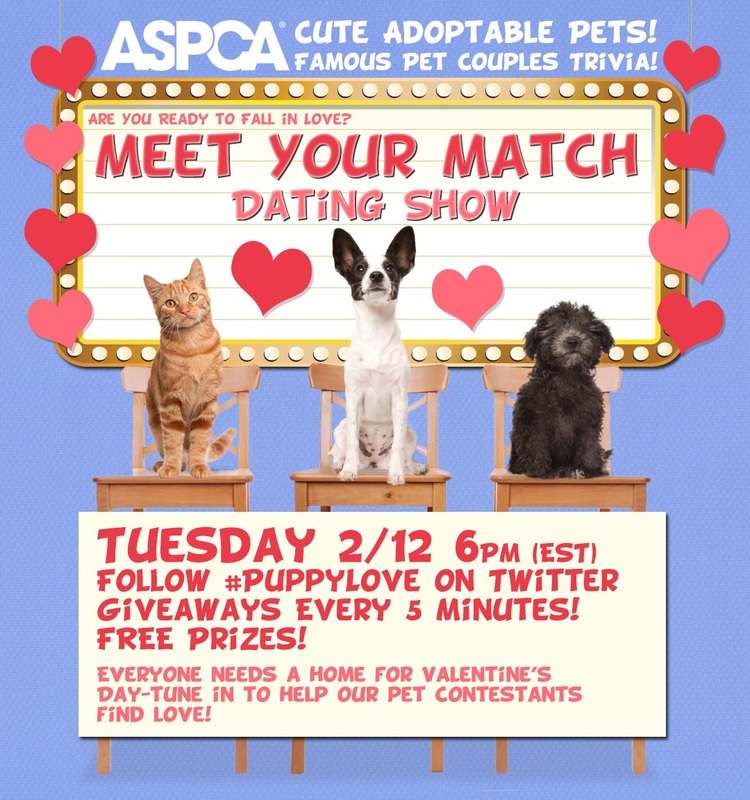 #PuppyLove Dating Show! Presented by the #ASPCA. Help Shelter Pets Find Homes For Valentine’s Day! Michigan Humane Society’s Valentine’s Telethon, Presented by Purina, Airs Thursday, February 14th, As a bitterly cold winter drives need! 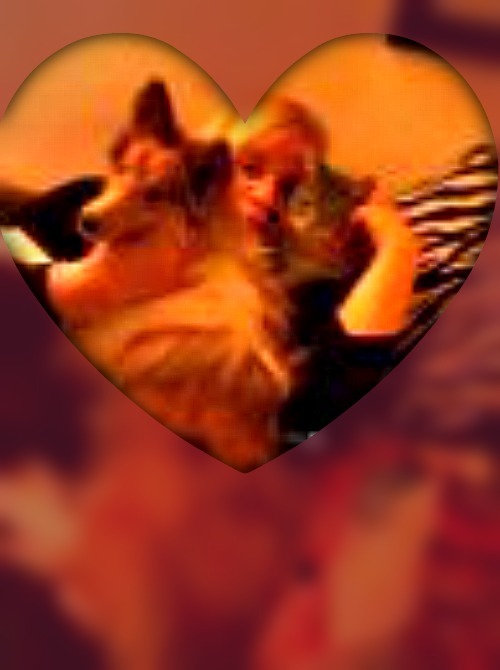 Love is in the air, and there’s nobody who loves you quite like a furry friend. 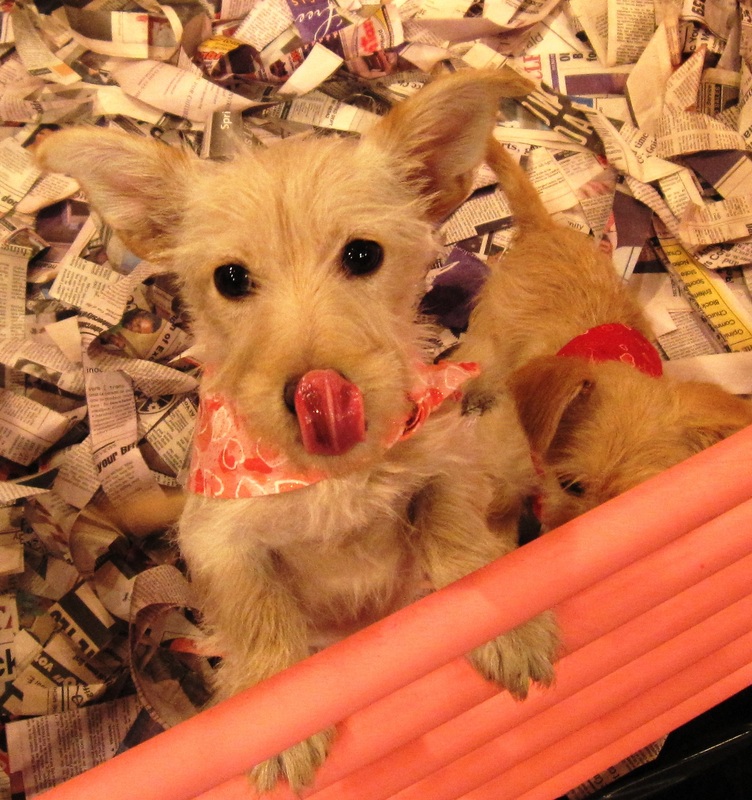 Show them you care by supporting the Michigan Humane Society’s 2013 Valentine’s Telethon, presented by Purina. WXYZ-TV Channel 7 Action News Anchor Alicia Smith will host the event, airing Thursday, Feb. 14, between 6 a.m. and 11 p.m. The 17th annual MHS Valentine’s Telethon will feature adoptable pets and stories that show how your support can make a lifesaving difference for animals in need. As a private, nonprofit agency, MHS receives no government funding and is not affiliated with any national humane organizations, relying instead on the generosity of its supporters to help save animal lives. MHS Valentine’s Telethon donations can be made online at www.michiganhumane.org on or before Thursday, Feb. 14, or by calling 855-MHS-GIVE (647-4483), 24 hours a day. In addition to Purina, sponsors of this year’s Valentine’s Telethon include Jim Riehl’s Friendly Automotive Group, US-Mattress.com, Center for Computer Resources, Meijer, Grid4 Communications, Strategic Staffing Solutions and Petco. The Michigan Humane Society (MHS) is a private, nonprofit organization which cares for more than 100,000 animals each year, while working to end companion animal homelessness, provide the highest quality service and compassion to the animals entrusted to our care, and to be a leader in promoting humane values. Michigan’s largest Dog Show – the family friendly 2013 Michigan Winter Dog Classic – Hosted by the Oakland County Kennel Club and Livonia Kennel Club, dog lovers can enjoy the four-day event packed with can’t-miss exhibits, entertainment, educational seminars and the newest feature, “My Dog Can Do That.” The 2013 Michigan Winter Dog Classic returns to the Suburban Collection Showplace in Novi, Michigan January 17-20, 2013. 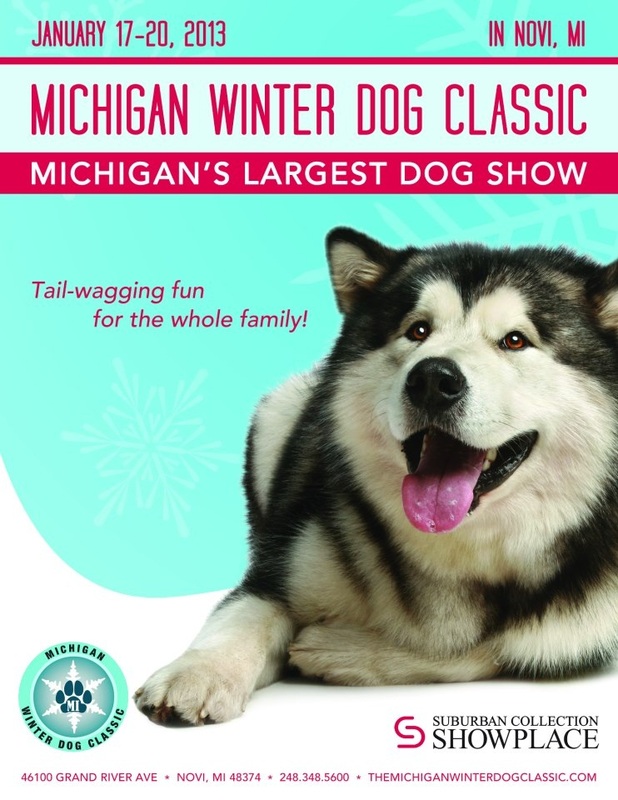 The Michigan Winter Dog Classic showcases more than 7,000 dogs, 160+ breeds of “man’s best friends” throughout the course of the event, including several breeds getting ready for the country’s premier Westminster Kennel Club Dog show in February 2013. Dogs will be judged in accordance with the American Kennel Club. For the first time in the history of the Michigan Winter Dog Classic, the annual event will feature the AKC’s attraction, My Dog Can Do That! This unique attraction allows owners to bring their dogs and let them try some of the fun competitive events (Saturday, January 19 & Sunday, January 20) from 10 a.m.-3 p.m. It is FREE to take part in My Dog Can Do That! Participating dogs must be at least 6 months old and have proof of rabies vaccination. No pre-registration is required for My Dog Can Do That! During My Dog Can Do That!, professional trainers will show owners how to get their dog started in the exciting sport of agility, which is an obstacle course for dogs. 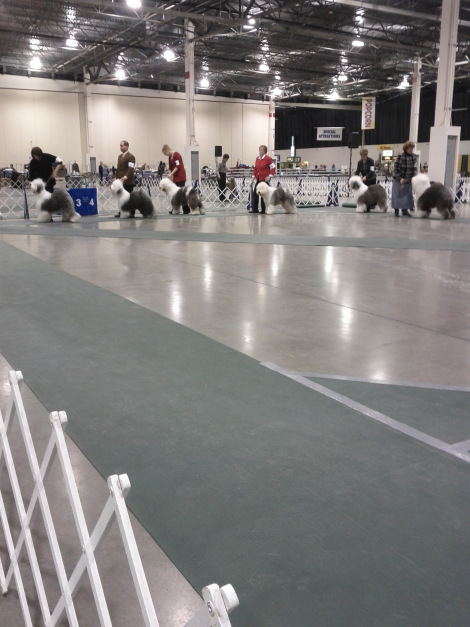 They will help owners try beginning agility equipment with their dog – plus give them some helpful obedience tips. They will also have information on where to find professional dog training classes in the local communities. 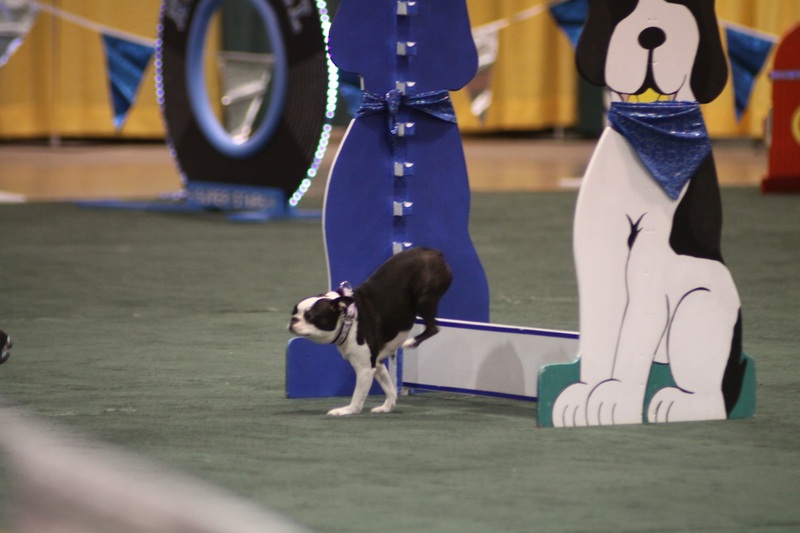 In addition to trying agility with your dog, you can test your dogs’ manners and basic obedience at the AKC Canine Good Citizen tests from noon to 3 p.m. Saturday and 11 a.m. to 1 p.m. Sunday. For more information on My Dog Can Do That! and the AKC Canine Partners program, access www.akc.org/mixedbreeds, email akccaninepartners@akc.org or call 919-816-3749. 9 a.m.-6 p.m. ~ Friday, January 18, Saturday, January 19th and Sunday, January 20th. Last year Mom was lucky and was able to go, this year she isn’t sure if she will be able to attend. Mom enjoyed herself immensely and bought some really cool things there! Here are some photos that Mom took from her visit last year! I am upset because Mom is telling me she thinks that we can’t make it. I wanted to try my paw at agility!! For those who CAN make it, this is gonna be a barking GOOD TIME! Every year, too many struggling pet owners are forced to give up their pets because they can no longer afford to feed them. This holiday season, the Michigan Humane Society (MHS) is teaming up with the Detroit Red Wings for a “Fill the Truck” event to support MHS’ free pet food bank and help keep families together. MHS is asking for the public’s support of this pet food drive to help keep its pet food bank stocked throughout the holiday season and beyond. The “Fill the Truck” event takes place on Wednesday, Dec. 19, from 11 a.m. to 3 p.m. at the MHS Detroit Center for Animal Care. 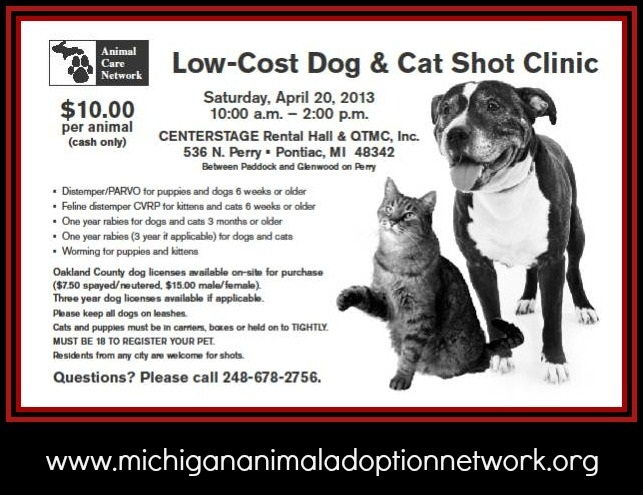 During the event, an empty truck will be parked outside the MHS Detroit Center for Animal Care at 7401 Chrysler Drive. MHS needs the community’s help to fill it up for local pets in need. From 1 p.m. to 3 p.m., MHS will be joined by former Detroit Red Wing great Kirk Maltby, and the voice of the Red Wings, Ken Kal, to help fill the truck. All members of the public are welcomed and encouraged to drop by with donations of food and to lend their support. 1-866-MHUMANE, Monday through Friday, from 8 a.m. and 5 p.m. The Michigan Humane Society is a private, nonprofit organization which cares for more than 100,000 animals each year, while working to end companion animal homelessness, provide the highest quality service and compassion to the animals entrusted to our care, and to be a leader in promoting humane values. Puppies are not Toys: Take the ASPCA Pledge not to Shop in Stores that Sell Puppies-Enter to win an ASPCA Holiday Gift Pack! Before I began blogging I knew nothing about Puppy Mills and was one of many others who would walk into a pet store and would begin to “ooooh and ahhhh” over the adorable puppies that would greet me. I didn’t have a clue. 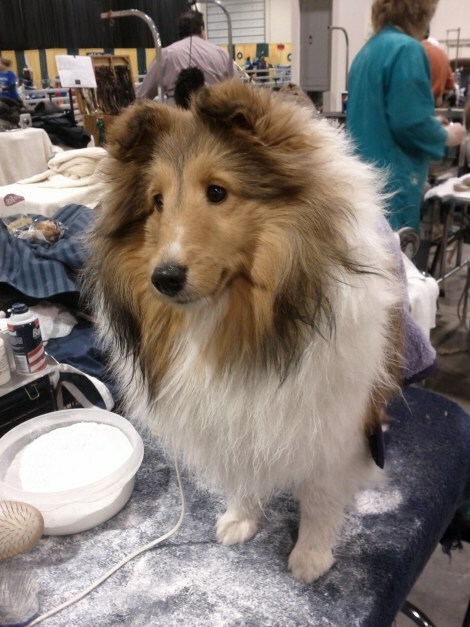 I knew nothing about where these puppies came from and what they had been through, until one day when I was playing with a darling Shetland Sheepdog puppy named Scarlet whom I had fallen madly in love with. I had fallen so deeply, that my husband and I were set to pay the $900 (YES $900 fee to purchase her), and then…I called the vet. While excitedly telling him of my incredible “find”, he asked where I had found this puppy. When I told him she was at a pet store I received an education…AND FAST. In no uncertain terms he told me NOT to purchase this puppy no matter how much I had fallen in love with her because she had more than likely come from a puppy mill. He proceeded to tell me exactly what that meant. Please share this video with your friends on Facebook and Twitter—and kindly ask them to share it, too. We’re counting on your help to reach millions of people with this important message. For more info please visit www.nopetstorepuppies.com. As you may know, the holiday season presents a time when many people are buying gifts in pet stores. According to newly released poll, Americans plan to spend more than $2.5 billion on pets over the holidays this year. Unfortunately, 59% of pet gift shoppers would consider shopping at a store that also sells puppies—meaning some of that $2.5 billion in revenue may be supporting the puppy mill industry. The ASPCA is aiming to reduce this high percentage of potential shoppers by encouraging them not to shop for gifts at stores that sell puppies. As an alternative, shoppers may consider giving gifts that make a difference in the lives of animals in need, such as those from our online store. When the ASPCA contacted me asking if I would share this video and information I happily agreed. If it will help educate millions of others the way I needed educating myself, I am happy to do so. The ASPCA has kindly offered a Holiday Gift Pack for one of my lucky readers and YES, THIS CONTEST IS OPEN TO EVERYONE, NO MATTER WHERE YOU LIVE!!! 3) Please visit http://www.nopetstorepuppies.com/ and take the pledge that if a pet store you visit sells puppies, you will NOT purchase anything there! Leave a comment (with a way of contacting you should you be the lucky winner) and let me know how many of the above steps you have completed. (The more steps you complete the more entries you will have in the contest). All entries must be received by 5pm EST MONDAY, DECEMBER 10th. THE LUCKY WINNER WILL BE ANNOUNCED ON WEDNESDAY, DECEMBER 12! GOOD LUCK! Also check this out! I am going to try to make it and hope that many of YOU will be there too!!! Bark at me on Twitter!